Emily Stone is the Naturalist/Education Director at the Cable Natural History Museum. When springtime starts with persistent ice, gray skies, and tepid weather, it’s hard to get excited about the season. So I did what a lot of folks do: I went south. The drive down to Stevens Point, Wisconsin, was like traveling into the future. Bare fields stretched out languidly in the sunshine, migrating ducks paddles on puddles, and snow had retreated into the shadows. Back home, snow and ice still covered most surfaces and just a few new birds had arrived. Perhaps the most exciting part of my drive was the end, when I stepped out onto the muddy parking area at the Central Wisconsin Environmental Station and heard the loud, rattling, trumpeting call of a sandhill crane. The thrill that went up my spine is quite different than the warm waves of happiness induced by a chickadee’s “hey sweetie” love song. And somewhere in the middle of those two is the joy of hearing the first ringing konk-la-ree call of a red-winged blackbird with its energetic trill at the end. All of those sounds echoed through the pines, and I couldn’t help but smile. 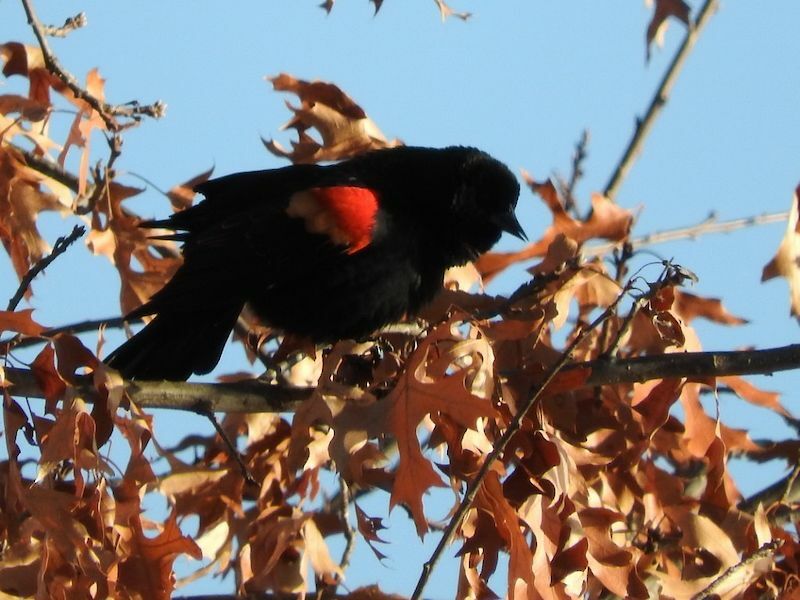 Red-winged blackbirds are true harbingers of spring. While they are year-round residents in much of their range, which stretches from the Yukon down to the Yucatan, the northern breeders must migrate far enough south to find crop stubble with waste grain and weed seeds not buried by snow. They gather in large flocks of as many as several million birds, and fly up to 50 miles each day from the roost to foraging grounds. For red-winged blackbirds in the Great Lakes region, this generally means about a 700-mile trip. That’s not far in comparison to our “neotropical” migrants like hummingbirds, flycatchers, thrushes, and warblers who fly thousands of miles to overwinter in Central and South America. Those birds are nectar or insect specialists, and can’t eke out a winter survival on seeds alone. One advantage that staying in the neighborhood gives red-winged blackbirds is that they have a better idea of how this particular spring is progressing, and can adjust their migration schedule based on weather. Neotropical migrants have no way to tell that spring is coming early in the north, so they stick to more stable cues—like day length—to decide when to migrate. Weather still affects their progress, since a winter storm or unfavorable winds can cause a delay, but their timing tends to be more consistent. As a side note, robins can subsist on frozen fruits and berries that are held up above the snow. A number of them stick around each winter, farther north than you’d expect. Because you could also spot one weathering out a January blizzard in an orchard, they are not the best indicator that spring is on its way. Red-winged blackbird males overwinter even closer to home than the females, because they have good reason to get back north as early as possible. The first male often gets the best territory, and it’s their gloom-piercing call that seals the deal. Belligerent males display in a “song spread” that includes fluffing up feathers, spreading their tail, raising their shoulders, and flashing their red epaulets, all while singing at the top of their lungs. We may appreciate this colorful performance, but it is not friendly, and it is not for us. While the adventurous males who are leading the charge north are not on territories yet, they are already singing loudly—warming up for the big show. Drab, brown females will follow later, after insects begin to hatch. The ladies need a high-protein, high-calcium diet to prepare for egg laying, and have no reason to risk getting caught in a blizzard. Once they arrive, females will choose a male’s territory, and set up a smaller territory within it. As many as 15 females might nest in a single male’s territory, but the average is five. Nests are built low to the ground, and are suspended among some upright stems of marsh plants. Females wind stringy plant material, wet leaves, and decayed wood into a bowl, and then line it with soft, dry grass. My trip south was short, but I brought a little bit of spring home with me. As I stepped out of my car in the Museum’s parking lot, the first sound that greeted me was a ringing konk-la-ree. Maybe the warmth of that song will help melt our ice!